There are probably more myths and misunderstandings about bore glazing than there are about anodes, and that is a very large number! This article is intended to explain the main reasons for the problem and to eliminate some of the suggested cures. When a modern engine is built, the cylinder bores are honed, using a diamond abrasive. The intention is to produce a crosshatch appearance with scratches from both directions at about 22 degrees from the horizontal. The microscopic surface roughness at this stage is a series of peaks and troughs, and in the past the engine was assembled at this stage. Part of the running in process was to wear off the peaks, to generate the desired ‘plateau’ finish. Modern practice is to machine the plateau finish, largely eliminating the need for running in. The engine delivers good compression right away, there is no blue smoke in the exhaust, emissions and oil consumption are reduced, and the rings last longer because they have not had to wear to conform to the bores. The plateau finish is essential to ensure reliable operation of an engine. In service the troughs contain the oil that lubricates the piston rings as they pass across the cylinder. If the troughs are destroyed the piston rings will not be lubricated, causing high temperature, blow-by and rapid wear. Troughs may be lost by one of two means – either they can be filled with a lacquer or varnish, or the surrounding bore can be worn away. These two mechanisms are known as bore glazing and bore polishing. Clearly they are not the same thing. Section of unused bore at high magnification. The surface consists of microscopic peaks and troughs. Surface view of typical honed bore. 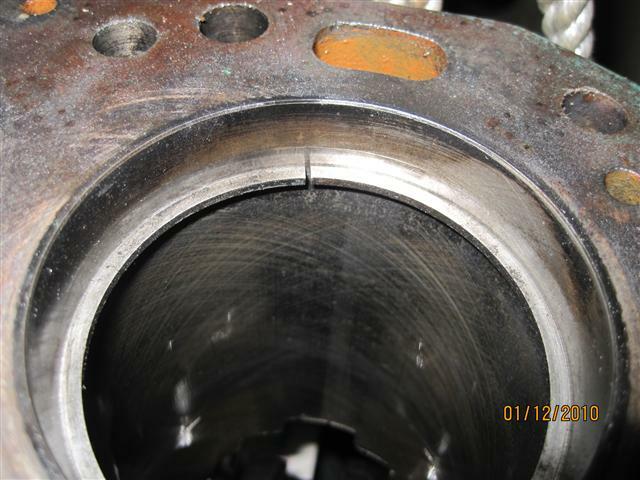 This appearance should always be visible, its absence indicating that ring lubrication will be poor. Ideal section of a cylinder bore, peaks worn or honed off to produce a plateau finish. Cylinder bore glazing results from prolonged light load running, particularly during the running-in process, and leads to the formation of a surface coating or skin derived from chemicals present in the oil and fuel. If glazed cylinder bores are examined, it is not unusual to see the honed crosshatch markings beneath a super-smooth, highly polished, varnish-like layer. Bore glazing occurs at low speed and light load operations, particularly resulting from blow-by in new engines. Exhaust gases passing piston rings in newly built or re-built bores can react with oil and wear products, forming a golden-coloured varnish glaze. Most engine manufacturers warn against the potential problem. Sabb and Lister-Petter are in surprising agreement on the subject, as shown in their operator’s handbooks. In each case the wording is identical: “Long periods of light or no-load running early in the engine’s life may lead to cylinder bore glazing and high lub oil consumption.” Cummins, Perkins and MAN all have issued directives limiting the run time at idle to prevent bore glazing. Based upon my own studies and discussions with lubricant specialists I believe the fundamental cause of glazing to be the condensation of combustion products onto cold bores when the engine is first started. A slow increase in temperature, such as would be experienced when battery charging, would cause this condition to persist for a far longer period. Raw-water cooled engines are likely to be more affected by the problem, both generally and in particular when battery charging. Bore polishing is characterised by a clearly defined area of bright mirror finish on the cylinder bore. It is caused by local mechanical wear of the surface, resulting in loss of oil consumption control. It is probably brought about by a build-up of carbon deposits in the ring area. Use of a high-specification oil, such as a synthetic, may also contribute to this problem.Under-loading of the engine will cause a high wear rate due to incomplete fuel combustion and loss of lubrication, resulting in cylinder bore polishing and fouling of exhaust ports and valves, along with insurmountable amounts of exhaust pollution. Proper and controlled loading is therefore essential. It increases diesel engine life by up to four times and improves the efficiency by ensuring that the engine has sufficient loading at all times. The use of incorrect oils in lightly loaded engines can lead to problems with bore glazing. The designations API CC and CD have been obsolete for some years, although many engine manufacturers, e.g. Volvo and Yanmar, continue to specify them. Some experience suggests that using oil of the recommended replacement grade, API CF-4, may well cause oil burning problems and cylinder bore glazing. If your engine manual specifies API CC/CD oil then either use the engine manufacturer’s own (liable to be sold at a premium), one from a national, reputable motor factor, or one from a specialist oil supplier. Castrol technical advice is not to use modern hi-tech multigrade oils in boat engines which remain at static revs for long periods. Modern automotive engines appear to be less prone to bore glazing thanks to their variable revs. Friction modifiers in engine oils are used to reduce internal engine friction and are common in low viscosity oils where fuel economy is important. They are also effective anti-wear agents. In the past these were believed to contribute to bore glazing although current technologies are claimed to have overcome these problems. Low viscosity oils should be avoided in marine engines. A fully run-in engine is unlikely to suffer bore glazing, provided that its sump is filled with the recommended lubricant. Piston rings in an engine that has run for about 100 hours will conform well to the bores, limiting blow-by and oil consumption. An engine with less than these hours should never be run at light load for long periods, as is typically done for yacht battery charging. In the middle part of its life, glazing is less likely while the bores remain in good condition, although as wear increases its likelihood will increase. However, bore polishing is always a possibility with light loading. The solution is always to load the engine when battery charging, by driving the propeller. An engine that is driving the boat will never suffer from either glazing or polishing, even if it is at anchor or on a mooring. Yanmar’s workshop manual suggests that after two hours of low-speed operation their engines should be revved in neutral to maximum speed in about five bursts, to clear out carbon deposits. They also suggest that periodical operation under full power while underway will benefit the engine, for similar reasons. Many remedies are suggested that purport to cure bore glazing. Mostly these involve tipping some sort of abrasive into the engine’s air inlet to abrade the cylinder bores. Any abrasion that takes place will be along the axis of the cylinder, allowing oil to pass the rings and therefore to increase consumption. The only real answer is to abrade the bores in a circumferential direction, using either honing stones or abrasive papers. This is clearly a bigger job than tipping powder into the air intake but it can be guaranteed to solve the problem with a modest outlay of cash.